As it goes with all handshakes, the SSL/TLS Handshake is where it all starts. The SSL/TLS handshake involves a series of steps through which both the parties – client and server, validate each other and start communicating through the secure SSL/TLS tunnel. The reason it’s called a handshake is that it’s when two parties – client and server come across each other for the first time. The handshake involves a number of steps that start from validating the identity of the other party and concludes with the generation of a common key – secret key if you may call it. Fundamentally, the SSL handshake is nothing but a conversation between two parties (client and server) wanting to accomplish the same purpose – securing the communication with the help of symmetric encryption. Imagine this SSL Handshake Process as a dialog between the two. From now on, every bit of data transmitted back and forth between client and server will be encrypted. This is called the SSL/TLS handshake process. Why is SSL Certificate Mandatory? Properties of an SSL Certificate. HTTP vs. HTTPS, Do You Really Need HTTPS? 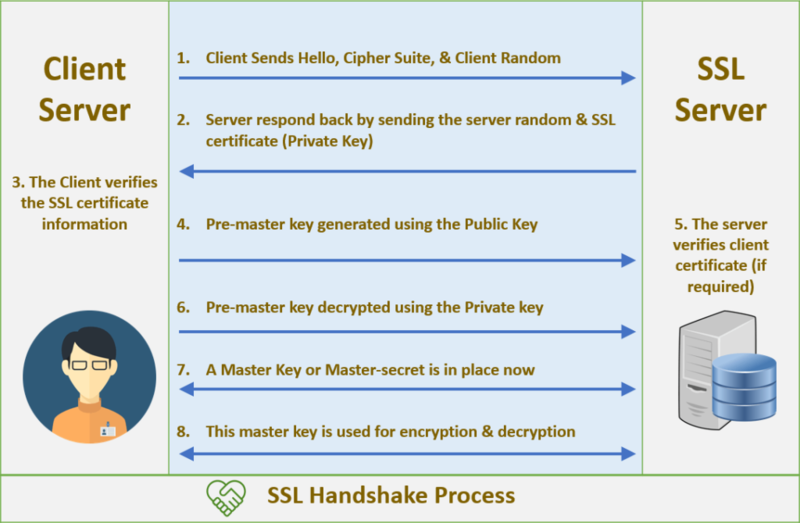 Easy steps that explains the SSL/TLS handshake process deeply with the meaningful conversation and its quick to understand. What is a Multi-Domain SSL Certificate? Should I Buy One? This entry was posted in SSLSecurity by seouser. Bookmark the permalink.